Adam Air was a private low cost airline of Indonesia with its base at Jakarta, Indonesia. With its perfect on board services, Adam Air had become traditional carrier of Indonesia. Adam Air used to provide scheduled air flight services to more than 20 domestic as well as international flights destinations. 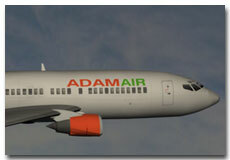 Founded in 2002, Adam Air started operating in 2004 with its air flight services. On the basis of safety issues, Air Operator Certificate (AOC) was suspended by the Indonesian government in 2008. 1. Adam Air provided so many discount facilities on hotels reservations. 3. Adam Air also offers special Holiday Packages for passengers.